From humble beginnings, the 5th Avenue range now looks very attractive and the Jazz is a fine-quality addition. Luxuriant build; lightweight; classy feel; jazz-specific tonality both acoustically and plugged in. The neck pitch/bridge height is a little steep; side-mounted jack socket may work loose; price. The Godin 5th Avenue Jazz is available faced with flame maple or in an all-black version. Tidy binding and a beautiful 'burst adorn the guitar's 14th-fret join. We found the 5th Avenue Jazz's neck angle a little steep. 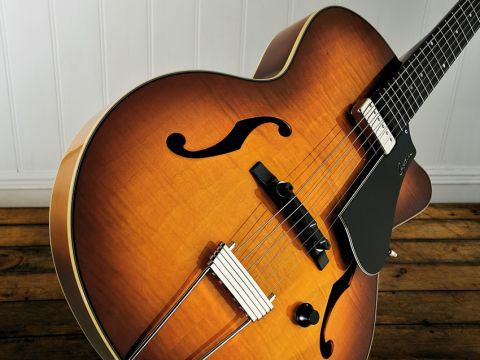 The 5th Avenue Jazz's humbucker has a full-bodied voice with excellent top-end clarity. From humble beginnings in 2008 as a non-cutaway acoustic archtop, Godin's 5th Avenue range has expanded into quite a family. It's a clever concept - the same 406mm (16-inch) wide, 76mm (three-inch) deep (at the rim) body is used for all the models, with or without the rounded Venetian cutaway. At the head of the table is the Jazz, which comes complete with the aforementioned Venetian cutaway and an all-laminate body; constructed wholly from wild cherry on the all-black version or, as here, with added flame maple facings. "Plugged in, the humbucker drops us right into that classic jazz territory with a full-bodied voice that has just the right amount of clarity to accurately reproduce complex voicings." For the most part it's a tidily made and lightweight guitar, which at its asking price (expect to pay £1,659 on the street) it really should be. The 'bursting is very classic and evocative, nicely polished with clean cream plastic body edge binding and tidy inner black/white purfling on the top. The neck joins the body at the 14th fret. The heel is laminated from a slightly mismatched piece of wood nicely 'hidden' by the 'burst finish; likewise the better-matched headstock splice. It has an enjoyably mainstream, slightly square-shouldered 'C' section, the fingerboard cleanly fretted with small gauge 'vintage-style' frets and edge bound with black binding, which hides the fret slots from view. The actual neck angle seems a little steep to us, meaning that the adjustable top of the synthetic Graph Tech Tusq bridge sits some way from its foot. Powering comes from a single Godin humbucker, which screws to the fingerboard end and floats over the top. Controls are conventional volume and tone units, complete with classy ebony knobs. Classy is a word you keep coming back to when describing this guitar, especially the classic three-a-side headstock and those open-backed Waverly-style tuners. On top of that, of course, the price includes an excellent Godin-made TRIC case, which is lightweight and quite 'space age' in contrast to the look of the guitar itself. Out of the box, the action is a little on the high side (approx 2mm at the high E at the 12th fret and just under 2.5mm on the bass-side) and many would probably prefer some flat- as opposed to round-wound strings, also of a heavier gauge. However, as supplied, we have a very playable guitar with a typically laminate archtop-like pushy mid-range projection. Plugged in, the humbucker drops us right into that classic jazz territory with a full-bodied voice that has just the right amount of clarity to accurately reproduce complex voicings. But not too much, so that higher string runs and licks sound thick and strong, not thin and stringy. This tonality is replicated over numerous amps both electric and acoustic that we try. The only adjustments we need to make are in regard to the low end, which through some amps can be a little over-cooked. Through the fuller range reproduction of an acoustic amp you'll hear more high-end clarity too and with some specific EQ'ing an altogether more acoustic voice emerges; though still with plenty of jazz thrum. The 5th Avenue Jazz is certainly aimed at the more experienced jazz player. Yes, that neck pitch and bridge seem on the high side but the overall lightweight and classy build, not to mention good playability, a clean fingerboard with plenty of air to the string spacing, a lively acoustic resonance and very jazz-specific plugged-in voice all tick the right boxes. Our only reservation is the price. Even at the lower street price it faces very stiff competition from the likes of Eastman, Peerless and Ibanez. But we'd suggest you take time to play this one; maybe it'll speak to you, as it did with us. Price alone isn't everything, especially when a guitar sounds as right as this one.